Our branch company Sino Mould is specialized in manufacturing plastic thin wall molds. The steel used for the thin wall container is usually stainless steel like DIN1.2316 or S136 stainless steel. With twice heat treatment to the steel, the hardness of the steel can reach to HRC56. AS thin wall molds need to be produced under high pressure and high speed situation. The steel has to be with very good hardness. Otherwise the mold will be easy wear out and the product will come out with flash easily. The thickness much smaller, the much more difficult the mold is. As mold cavity will be vacuum, plastic flowing is very hard to reach each corner of cavity. So this mold must work upon high speed injection machine. We Dakumar machinery spent big efforts in developing high speed injection machine which can provide the demands for thin wall molds. The components of the machine are all with very good brand. It can basically ensure the quality of the machine. This high speed injection machine with the advantage of high speed; high efficiency; high safety; high precision; high energy saving. Machine adopts high precision single cylinder injection system especially suitable for high speed injection, with low-inertia and high response speed. Accumulator to realize high speed injection, the max injection speed can reach 300-400mm/sec. Machine ACC/DEC response time can reach 30ms. 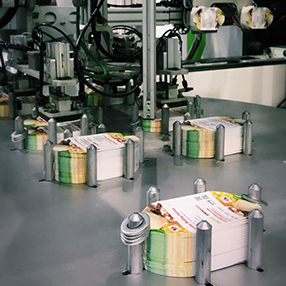 · Gripper for feed the label into the mould. · Sucker for picking out the plastic labeled parts. · Stacking unit for stacking the plastic labeled part. · IML impresses by the outstanding quality of the decoration with a high brilliance which is achieved by either offset or gravure printing. · Printing on the container base (e.g. EAN code for convenient scanning) becomes ever more important. The IML process permits to decorate all five outside surfaces of the container in one single operation. · The IML method can enhance the barrier properties if multilayer labels are applied to the entire outer surface of the container, and even extend the durability of the contents. · The label inserted by the IML process gives the mould a higher stiffness. · IML enables the production of decorated and packed containers in a single working step. Internal transport and intermediate storage are thus eliminated. · IML permits to change the container decoration (label) without interrupting production. What is In Mold Labeling (IML)? In-mold labeling is a pre-decorating technique used worldwide for blowmolded bottles as well as injection molded and thermoformed containers or other plastic objects. Pre-decoration is the application of a label to a container before it is filled with product. Labels for injection molded IML do not require an adhesive on the back side. The IML process eliminates the labeling step and all associated equipment and labor. In the in mold labeling process, a label or applique is placed in the open mold and held in the desired position by vacuum ports, electrostatic attraction or other appropriate means. The mold closes and molten plastic resin is extruded or injected into the mold where it conforms to the shape of the object. Why is in mold labeling is so popular? -Lower costs than other pre-decorating methods. -No extra labeling step or equipment. -In-case product filling and capping. 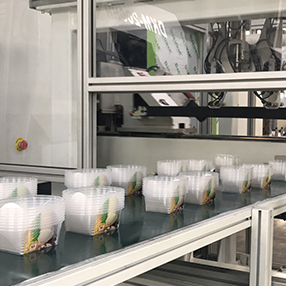 450ml round juice cup whole IML system to Uzbekistan:- The cup size is Up￠95*110mm, Bottom: ￠ 68*110mm,thickness is 0.6mm,two cavities cup mould with valve gate, the mould size is 566*366*495mm,it run on DKM188 high speed injection machine and side entry robot from Italy, the cycle time is 6 seconds. 250ml ice cream container whole IML system to Bulgaria:- The container up size is 139*98mm,bottom size is 90*65mm,Height is 45mm, two cavities container mould With valve gate, mould size is :416*256*275mm,it run on DKM188 high speed injection machine and top entry robot from China, the cycle time is 8 seconds. 10L paint bucket whole IML system to Egypt:- The bucket size up diameter is 358mm,bottom diameter is 318mm, one cavity mould with point gate, the mould size is 616*525*398mm, it run on DKM500 injection machine and top entry robot from Italy, the cycle time is 20 seconds.